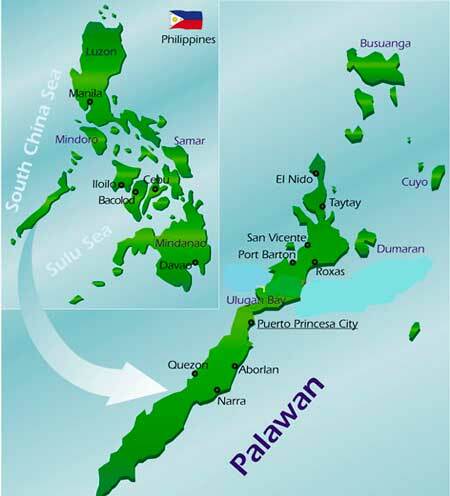 You can reach Palawan Island from Manila and other areas of the Philippines. Is connected by air from the international as well as domestic airports at Cebu, Manila and Caticlan (Boracay) through four gateways: El Nido Airport, Puerto Princesa City Airport, and Cesar Lim Rodriguez Airport in Taytay and Francisco Reyes Airport in Busuanga. There are also ships from Manila to ports in Coron and Puerto Princesa. IMPORTANT: you can not fly internally from Puerto Princesa to El Nido, so you must choose for one day shuttle van transfer (2 days return) if you want visit both areas. Air Philippines, Cebu Pacific and Philippine Airlines fly to Puerto Princesa City every day. Flying time is 1 hour and 15 minutes. Cebu Pacific fly to Puerto Princesa City. Flying time is 1 hour and 15 minutes. Southeast Asian Airlines operates flights to /from Puerto Princesa. Flying time is 1 hour from/ to Busuanga and 30 minutes from/ to El Nido. Southeast Asian Airlines from Caticlan on tuesdays and back on friday. Every Thursday, Negros Navigation from Manila for Puerto Princesa. Back to Manila every Saturday. other solution is Super ferry from Manila to Puerto Princesa every friday and back to Manila every sunday. It takes between 18 and 22 hours from Manila and includes a stopover at Coron. Negros Navigation to Coron for Puerto Princesa every Friday and back to Coron every saturday. Other solution is Super ferry,leaves from Coron every saturday and back on sunday. Getting around the island is easy, teven if some roads are irregular, but a new road is now being built from Puerto Princesa to El Nido. Also you can choose boats instead to travel. When you are in El Nido, best way is by jeep because roads are narrow for other larger transport. You also can hired motorbikes and bicycles for other kind of trips. There is a possibility of transfer/shuttle services from Puerto Princesa to El Nido that takes 6 hours; from Puerto Princesa to Taytay takes 4 hours. Roads are not so accessible in the wet season, from june to september.